We all know that missing artwork has the habit of turning up in odd places: in a cemetery, on eBay, in the parking lot of a psychiatric hospital, even inside the bathroom of the museum from which it was stolen. But inside of a former meth lab? 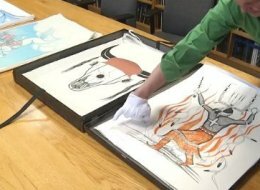 While searching a condemned apartment that had been abandoned two years ago after it was discovered to be housing a meth lab, a police officer stumbled across a portfolio containing $33,000 worth of prints by late Kiowa artist Al Momaday. Perhaps the find wasn’t completely surprising, as the Albuquerque apartment was known as a stash house for stolen goods. Still, at this point, no one seems to have noticed the prints’ disappearance and their provenance remains unknown. Andrew Connors, the curator at the Albuquerque Museum of Art and History who identified the prints after their discovery, suggested that they may have been stolen from a warehouse or possibly a storage building behind a gallery. He suspects the prints may have been stolen – certainly whoever left the meth lab behind had no lawful reason to be in possession of them. The Momaday prints may not come close in value, number, or name recognition of the Gurlitt hoard, but in their discovery lies a valuable lesson for provenance researchers and others in pursuit of stolen art, whether working on establishing a work’s ownership history or searching for a particular missing piece: don’t discount the unusual and unexpected, think outside of the box, and don’t stop thinking and looking, because, well, you never know how or where something might turn up.